I’m expecting to be emailedl the link to my final exam in the Coursera statistics course this weekend, and by way of revision I’m using my own data in R for the first time. The first challenge is making sure my data is R “fit” – I entered it into Excel the first time, and though I made sure that even category data was entered numerically, I did some foolish things. The first of which was entering the data for the recommendation rating in catagories rather than just putting the raw score in. So I’ve just gone back to my original collected data and re-inputted the raw numbers. Then I needed to get the excel data into R. I like this post on that subject, which starts off with “don’t put it into excel in the first place.” It seems the quickest way is [Ctrl]+[C] copying the relevant data in Excel, then in R entering > gh <- read.table(“clipboard”) lets try that. Oh dear, that doesn’t look good, what does the table look like in R? So lets try a third method, exporting the excel sheet to the csv (comma separated values) file and using read.csv(“gh.csv”, header = T) rather than read.table. Aha success! Though some (but not all) of the blank fields come up “NA” rather than empty. I’ll work out if I need to worry about that later. But now I have my data in R, I can at least have a look at it by using the describe() function (as long as I have loaded the package library(sm), which I have). The table that produces tells me that some of my category date is easily identifiable as such, the “Very enjoyable” five category Likert question is full of NAs (and NaNs – don’t know what that means). Same with the categories describing the groups that the respondents visited with, and the weather. That’s fine, I don’t need to worry about those yet. More importantly the continuous numerical data has returned a number of descriptive statistics. I asked a number of questions scored on a seven point Likert scale, about how much respondents agreed with statements that: the experience added to their enjoyment of the visit, and added value to their visit; their choices changed the story; they felt an emotional impact; it was a great story; they learned about the history of site; they were inspired to learn more; and, they enjoyed listening as a group. I also asked them to score on a ten point scale how likely they were to recommend the experience to friends and family. You could argue that being a Likert scale, this is categorical data, but I think there’s a strong case for arguing that it is continuous, especially if you collect the data with something like QuickTap survey. That’s not the case with other Likert scale questions, like the one I asked based on a National Trust survey question about how much they enjoyed their visit. Those five options are clearly categorical. I got 39 responses for most questions, one person declined to answer the the question on story so I’ve only got 38 there. And only 34 answered the question on being a group (the other five came on their own). Looking at the means and medians, you can see that some questions (adding to enjoyment; adding value; and learning) were answered very positively – the median is the top score, 7, and the means range from 6.44 to 6.59 and nobody scores less than four. Make a histogram of these and you’ll see they are not “normal” curves. 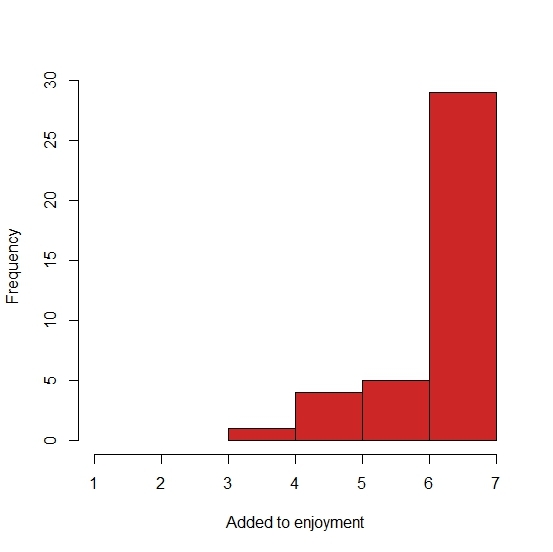 They are negatively skewed (“the skew is where there’s few”) and indeed, the describe function reports a skew of -1.72 for the “Added to my enjoyment” question. Cool. Again, not “normal” and so I know I shouldn’t be doing what I’m about to do, but I want to see if there’s any correlation between some of the responses to the 7-point Likert questions I asked, and Recommendation. So, lets try some regression! So, there is some correlation. (Remember correlation does not equal causation.) 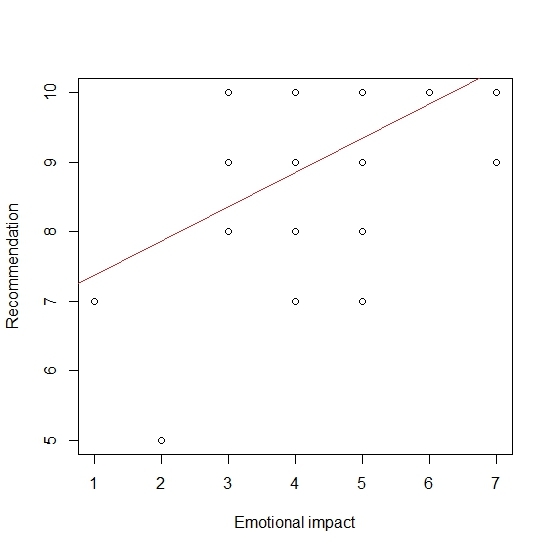 This regression model of recommendation and reported emotional impact tells us that the predicted intercept (Recommendation with zero emotional impact) is 6.88, and the regression coefficent is about 0.49. 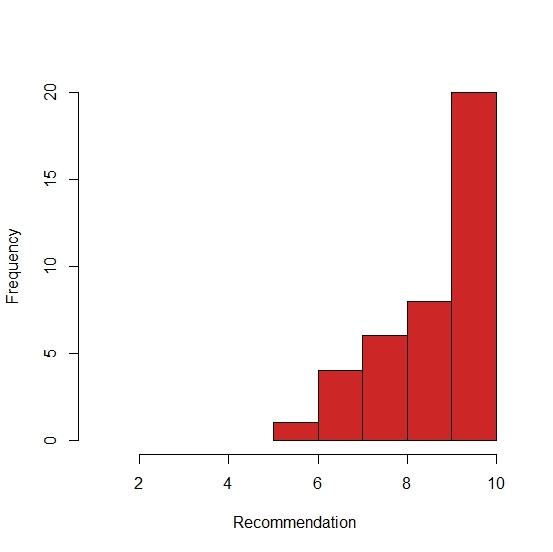 R squared (the proportion of variance in recommendation explained by emotion impact) is about 30%, which seems reasonably chunky. Lets finish off with a Null Hypothesis Significance Test (NHST). Pearson’s product-moment correlation tells us that t = 3.9748, degrees of freedom = 37, and the p-value = 0.000314. Its that p-value is less than 0.5 which the the arbitrary number that marks the divide between the null-hypothesis being true and false. It measures the probability of my obtaining these (or more extreme) data, given the assumption that there is no relationship between the variables. the As my p-value is less that 0.5, and can “reject the null”. Of course I might have made a Type 1 error here. First of all, I’ve learned how long this takes. I’m only about a third of the way through what at learned on the course, and the email about my final exam is due tomorrow! I’m also aware that I’ve “proved” a correlation between a variable with a “normal”(ish) distribution, and another with a very different distribution. My revision hasn’t got to what to do about non-normal distributions yet. I’ve also learned that I need more data. When I’m making a scatterplot, more dots make me feel more confident in my findings. Though I’m reminded that NHSTs are biased by sample size, so that confidence can be false! I also want more variance in my data. 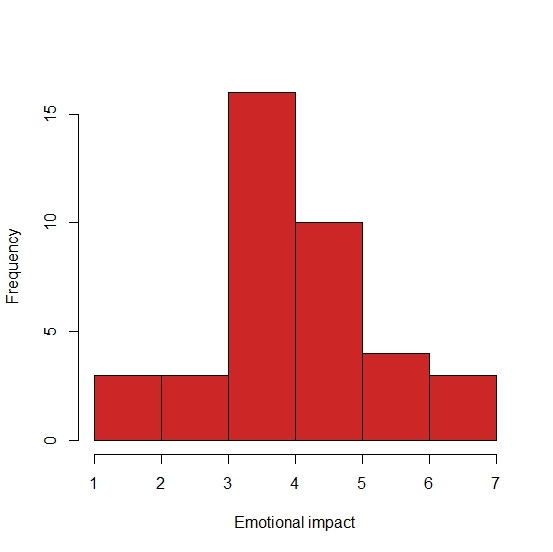 Likert scales on paper are limited, but in future I’m inclined to offer ten or eleven point scales where I can on paper, and as I discovered with the data I collected at Bodiam, touch-based sliders offer an opportunity to create 100 point scales which should discourage “clumpyness”. And I’m still convinced I can be cleverer with the questions, to obtain more “normal” data distribution curves. Sometimes I feel a bit like an impostor. I’m based in the University’s school of Archaeology, but I’m no archaeologist. Which is one of the reasons they asked me to review some of the media content for a planned FutureLearn course based around the Portus project. I guess what I’m looking at are what the film industry call “rushes,” basic edits of the a-roll material without any of the titles, captions or cut-aways to photos, maps and diagrams that the finished version will have. Each sequence did come with notes, though, about what some of those cut-aways and captions might consist of. So its like watching an early edit for Time Team, and I feel quite privileged to get this sneak preview. The course is obviously intended as a sort of Archaeology 101 – an introduction to the subject, and to the project. It showcases the University a partner in a long-term project, and it showcases the work not just of professionals and faculty, but of the students involved in the dig. Actually the Time Team analogy isn’t quite right, for two related reasons. Firstly of course, it isn’t quite as polished as Time Team. There’s no Tony Robinson for a start, and our presenters are not quite as relaxed in front of the camera as the Time Teamers. But therein lies the second difference. Time Team’s voice says “look at all these clever people using arcane technology to tell us about the past, you’ll never be a clever as them” whereas the Portus videos voice says “join as as we learn about learning about the past.” Here the lack of polish is an asset, it make the experience more authentic somehow. It’s the punk aesthetic again. The technology of media production has become so cheap that its no longer the preserve of organisations that need to sell their work (through licence fee, subscription or advertising). Now we can all share our enthusiasm for what we’re doing, and that enthusiasm sells the project. I could imagine down the line a number of students applying to Southampton’s archaeology department having seen this FutureLearn course.